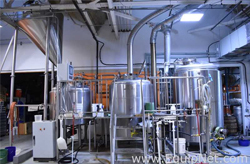 Leading asset management company, EquipNet, is currently hosting a sealed bid auction event featuring a complete brewery for sale. EquipNet is accepting bid packets now through December 28, 2018 at 1:00pm Eastern Time. The equipment from Hijinx Brewing Company located in Allentown, Pennsylvania is in pristine condition and features a 10-barrel system including hydrators, mash tanks, fermenters, and mills. The complete brewery is four years old and is equipped with a direct fire boiler and single infusion mashing system. Inspections are available by appointment only with 48 hours advance notice. If you would like to schedule an inspection or if you have questions about this event, please contact EquipNet Auctions at auctions@equipnet.com or 781-821-3482 x2162. To request your bid packet and see more details about this offering, click here.